Previously, Japan's Kokonoe Yume Bridge, pictured here, was the world's longest pedestrian bridge before it was overtaken by the new Charles Kuonen Bridge in Switzerland. Photo credit: shutterstock.com. Switzerland is a world tourist destination known for its beautiful landscape featuring a unique alpine diversity. The landscape provides a favorite spot for nature lovers and hikers, with tourism boards and private individuals seeking to improve the overall tourist experience. With the current world focusing on saving time and improving accessibility, Switzerland has not been left behind. The Charles Kuonen Bridge commissioned by psychologist and Swiss winery co-owner Charles Kuonen, allows hikers to navigate the Grabengufer ravine. The constant rock falls make it risky and sometimes impossible to navigate the ravine, having an even previously damaged bridge. According to Leisure Travel, Switzerland has now opened the world’s longest pedestrian bridge after ten weeks of construction. The bridge covers a total of 1621 feet across, is 25.6 inches wide and is suspended 279 feet above the ground. The bridge weighs 8 tons. The width of the bridge allows tourists to walk only in a single file. The height protects the bridge and hikers from rock falls, which are common in the region and may cause accidents. The Charles Kuonen suspension bridge was inaugurated on July 29. According to the CNN, the bridge, named after its chief sponsor, has broken the world record as the longest suspension pedestrian bridge though it is yet to be included in the Guinness World Book of Records. 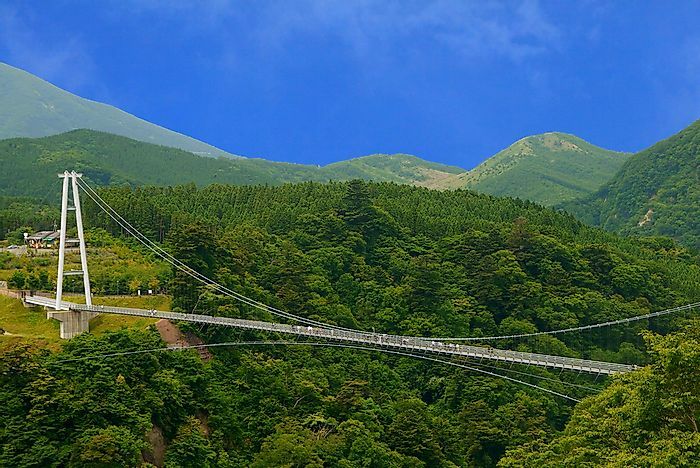 The previous record holder currently recognized by Guinness is Japan’s Kokonoe Yume Bridge covering a length of 1279ft. The bridge hangs above the valley between Zermatt and Grachen towns. For hikers, the bridge provides a unique view of the high peaks of Weisshorn, Matterhorn and Bernese Alps. The bridge, which replaced the Europaweg bridge that was damaged by falling rocks in 2010, reduces the time taken across the valley from three to four hours to ten minutes. The reduction in travel time across the ravine encourages more tourists who would have otherwise been discouraged by the long hours of navigating the valley. The bridge constructed by Swissrope cost 750,000 Swiss Francs to complete and is an attraction to high-altitude hikers. The bridge is built using steel and includes a system to keep it from swaying. The Zermatt Tourism Board advises tourists who are afraid of heights to have someone walk closely behind them or walk with their eyes closed, as it is possible to view the precipice underfoot.